One of the joys of working with young students is that they see the world from a unique perspective, sometimes surprising us with the way they see and represent the world around them. Rather than try to force them into the way we adults see the world, I try to honour this daily in the classroom. The approach I take to art seems to encapsulate this. In our classroom you’ll find an Art Studio stocked with a variety of ever changing open-ended art materials. What won’t you find? A model made by me for the students to follow. In my mind, there’s a big difference between honouring creativity and making crafts. There’s nothing wrong with crafts in other situations, but I feel they have no place in a truly child centred learning environment. Art exists in the eye of the artist, and time and time again students have blown me away with the stunning art they create when we provide them with materials, step back, and let them create. Sure, they may not create art in the way we imagined it, but it’s their art after all, not ours. This topic “creativity vs crafts” seems to come up most often around the holidays – as Kindergarten tradition seems to dictate some sort of “make and take” – an art project to send home for the holidays. Some classes may opt for the handprint reindeer, the step by step snowman, or gluing pom poms onto the precut Christmas tree. Myself, I’ve never really understood how this is art – if anything it seems more like a gift to parents from the teacher than the child. The teacher devised the plan, the teacher prepped the materials, and the teacher explained step by step. The child simply went through the motions. I’m sure parents do in fact love any sort of handmade item by their child, but I’d argue allowing students a higher level of artistic and creative freedom in the process makes for a much more meaningful end product. I had hoped to blog about this before the holidays, but didn’t want to spoil our class’ holiday surprise, as I know many of the parents read this blog. As a class, we’ve spent the last month and a half exploring the art of photography. This has fit perfectly into my philosophy around art being a way to capture a child’s unique worldview, rather than the teacher dictating how art “should look”. 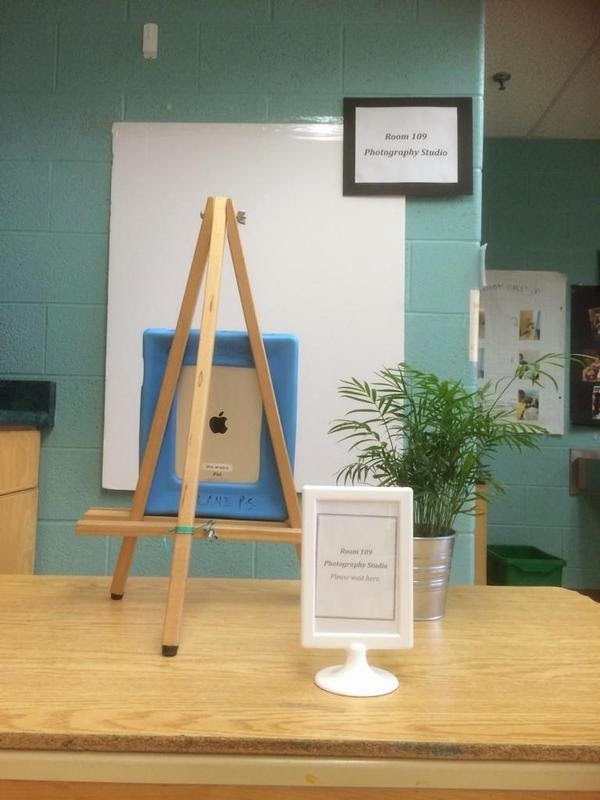 With careful use of an iPad, the students have captured stunning images of themselves, each other, and their learning. With help and input from the students, our dramatic centre transformed into a Photography Studio. Students had the chance to take self portraits, choosing their own pose, background, facial expression, etc. All creative choices were made by the students themselves. I simply stood by to make sure the iPad was being used safely (and it was, they were so careful! After a while I could leave that centre entirely and work elsewhere in the classroom fully trusting the students to take care of it). I had only intended to keep this centre open long enough to capture a self portrait of each student, but I quickly noticed the students interest lingering here. As well, it was fascinating to see how students “warmed up” to the camera over time. Many of the self portraits taken the first day it was open were stiff, with neutral facial expressions. However, as the centre remained open longer and longer, faces relaxed, students brought props from around the classroom, and personalities really started to shine through. In other areas of the room we studied books of famous photographs and discussed what we liked about certain photos. I found it so interesting to see the photographs students were taking. While we as adults may frame and focus a photo in a certain way, the young students had their own (great!) ideas about how to make a photo interesting. Towards the end of this project, students looked back at the portraits they had taken, and were asked to choose their favourite one. Again, this allowed them ownership over their art. It wasn’t me deeming which one looked “the best”, but rather them – and their unique perspective – making the final creative choice. With the help of our classroom’s fabulous Early Childhood Educator, students also designed and created their own picture frame to display their work. To honour our open ended approach to art, students were presented with a variety of decorative items, and made all choices about what they would use and where they would put it on their frame. They even made their own wrapping paper – mural paper was taped to our art studio table and students had full control over decorating it with bingo dabbers and markers! This project was achieved without any imposition from the teachers about how art “should look”, and no two final products looked the same. In fact, it was very much about process over product, and creativity over step by step, one size fits all crafts. In the end, we sent home what I hope is a meaningful, one of a kind piece of art that captures each child’s unique creative spirit. I won’t lie – it was a big project and took a lot of time, but as far as I’m concerned, it’s entirely worth it. I can’t share the portraits themselves, as I don’t show students faces online, but trust me when I say that the photos are stunning and wouldn’t be out of place on any Art Gallery wall. Allowing students the main role in creating art resulted in photographs that were even better than I could ever imagine myself. They create art in a totally different way than an adult would, and that's an amazing thing. In fact, I'm pretty sure the Room 109 Photography Studio is now a permanent centre in our room - there's just so much potential here - for expression, for creativity, for representation, for learning - all while embracing a child centred approach. So engaging! Is the photography studio still being utilized this much time later? It's been interesting to see how photography continues to weave itself in and out of our programming this year. While we don't still have the Photography Studio itself set up (student interest went elsewhere, and we responded), the concept of students taking photographs is one that still shows up often in our room. Since having this centre set up, students have been much more vocal about documenting their own work ("could we take a photo of this?") and also have taken that role unto themselves. It's been great that the iPad has gone from being a "teacher tool" to something for all.